The hair came off last night. I don’t think there are many words I can add to the picture. Definitely different. Maybe I thought there would be a poem or a big feeling to accompany this event. But mostly I just look at this picture the way you might. Like, wow. She looks different. We look in the mirror many times a day, just to check up, you know? Make sure the spinach isn’t stuck between the teeth, or do the short comb through. Imagine, you look at your reflection and you see someone but you have no idea who it is. Without her familiarity, is she a stranger? Or did the familiarity always mask the stranger that lives within us? Mostly I will wear the hat, scarf and even the wig so as not to scare little children. But I just have to say…. with compassion: sure it is cold with a bald head. You truly look like the Dali Lama, so peaceful and spiritual. 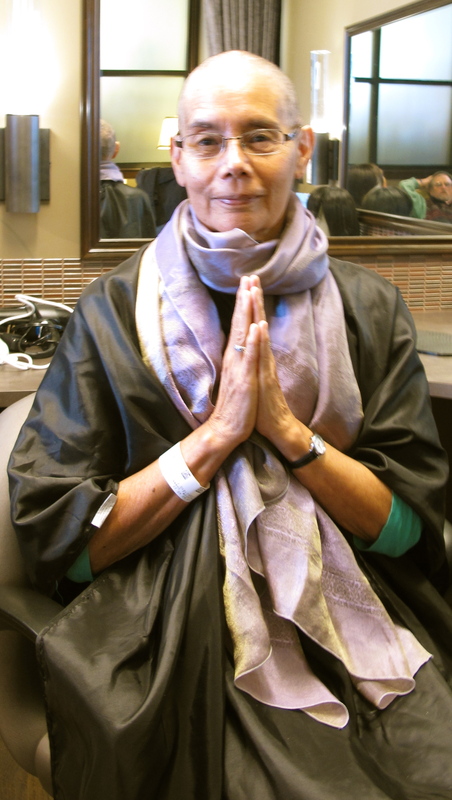 I just gave $$ to St Baldrick charity… hair for children with cancer. Sorry about the typos. My iPad has a mind of its own! WHEN it grows out, you will be soo cute. 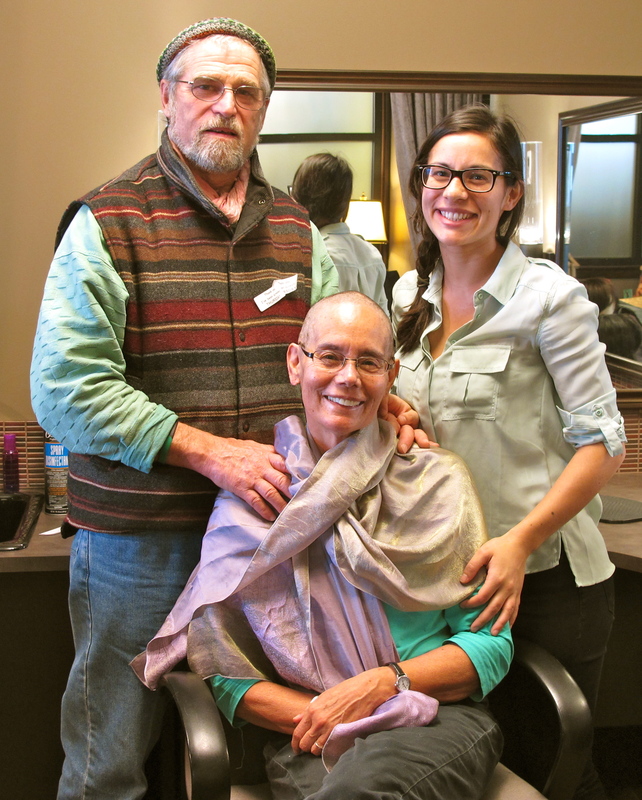 I was at a week-long spiritual retreat in Sedona a few years ago where they offered head-shaving as an option. Many took the opportunity to let go of their hair – I was not called to (but I would have if so guided.) It was profound for many and the reactions of friends and family members was wide and sometimes surprising. There are lessons in everything if we are open. Typed by thumb. Please excuse typos. Before seeing your photo, I was going to suggest some lovely henna decorations, but really, there’s no need. That beautiful stranger in the mirror is you. Huge octopus hugs from me and Paul. My first thought was how beautiful you look and how you will fit right in as a monk, yes definitely you need a scarf and a long saffron robe! You are a beautiful Buddhist monk. Stunning! I love the new look Shann – I can see now that your left ear is higher than your right, exactly the opposite of mine so that when we where our glasses and face each other our glasses will tilt the same way. I bet it was hard to see those lovely black curls fall but they’ll grow back. You actually look younger to me! Can’t wait to see you in person. You are so beautiful! you look very much the buddhist nun. Namaste….you are gorgeous.Much love to all of you. You are stunning! The light coming from you will be a magnet to children! Trust their curiosity. Your smile is powerful. Here is a big hug for you and your fearlessness… You are beautiful. PS: Make sure to get plenty of head rubs! To me, you look wise, and a bit younger, brighter. Is that because there is less for the viewer to focus on, or perhaps because you are learning unexpected strength and new-found insight/wisdom in your battle for healing? Before my mother died, she knitted baskets fulls of beautiful caps for people with sparse or no hair, and donated them to her local hospital. I hope there is something like that at your hospital for you to use, something knitted with love. If you decide to let your hair grow back, it will be interesting to see how it may be different than what you had been accustomed to: thinner/thicker, coarser/softer, darker/lighter, curlier/straighter; in any case, I’m sure you’ll find a sense of pleasure with whatever new look you develop, even now. Sending island community love and strength your way. SO beautiful! I love you! Who knew such a beautifully shaped head was under all that hair! I’ve heard other people who’ve gone through this say their hair grows back thicker and better than it ever was before. In the meantime, stay warm, safe and strong. Sending much love, light and joy your way. YES, beautiful. Beauty be within you, Beauty be around you, Beauty be above you, Beauty be below you….you are a Beauty.